Our only goal is to offer food products to consumers which have been carefully selected and produced with the best possible ingredients available and to price them in a way that is affordable by anybody. In other words: Premium Performance. Value Pricing. For Everybody. The Benefits of Olive Oil. Olive oil is not only a light and delicate addition to many wonderful dishes, it is one of the most health-promoting types of oils available. Olive oil is rich in monounsaturated fat, a type of fat that researchers are discovering has excellent health benefits. Antioxidants to help slow down the aging process of your skin, cells, tissues and organs. Strong Bones and Healthy Teeth. Scientific research increasingly supports the importance of total diet, rather than individual foods and nutrients. Pasta is a key component of many of the world's traditional healthy eating patterns, such as the scientifically proven Mediterranean Diet. Traditional dietary patterns confer greater health benefits than current Western dietary patterns. 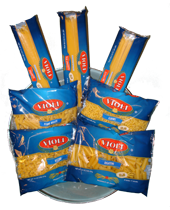 Pasta meals and other low-glycemic foods may help control blood sugar and weight especially in overweight people. Healthy pasta meals are a delicious way to eat more vegetables, legumes and other healthy foods often underconsumed. Tomatoes are a treasure of riches when it comes to their antioxidant benefits. Tomatoes provide an excellent amount of vitamin C and beta-carotene; a very good amount of the mineral manganese; and a good amount of vitamin E.
Reduced risk of heart disease is an area of health benefits in which tomatoes truly excel.